Quinten Massijs is born in Leuven around 1466, but he builds his career as a painter in Antwerp. He moves amongst humanistic circles, which clearly comes out in his work. He introduced new techniques and motifs and even new, moralising themes without also breaking with the tradition. Quinten Massijs is influenced by Jan van Eyck, Rogier van der Weyden, Hans Memling and Dieric Bouts, but also by Albrecht Dürer, Leonardo da Vinci and other Italian artists such as Raphael. His work is carried on by his sons Cornelis and Jan.
Quinten Massijs is presumably born in Leuven. He is the second son of a smith. Massijs registers himself as master in the St. Lucas guild in Antwerp on settles in the Huidevettersstraat. Not much is known about his school years. Before 1494, there were no registers kept of the guild in Leuven. From that comes the myth that he was an autodidact and smith, something which embellishes his genius. 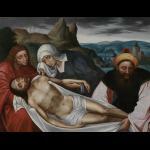 This grew into the 17th Century to a true reverence for the "Flemish Michelangelo". He marries with Aleyt van Tuyl. Three children are born from this marriage. Massijs declares before the magistrates in Leuven that he is 18 years old, hence his presumed year of birth. There are various schoolboys mentioned in the ‘liggeren' or registers: Ariaen (van Overbeke? ), Willem Muelenbroec, Edoardo Portogalo (according to art historian Reis-Santos) and Hennen Boeckmakere. They had to assist with the great altarpieces that Massijs makes. Later, he will give preference to smaller pieces, more intimate in character, mostly made for friends or humanists. One such example is the Saint Mary Magdalen (Royal Museum of Fine Arts Antwerp) from the twenties. Quinten Masijs never accepted thanks from the guild. Massijs established himself as an independent artist, but nonetheless enjoyed lots of prestige in his environment. With the religious works, it is noted that Massijs almost always sought a connection with successful examples from the 15th Century. Thus he came to presentations that are recognisable and immediately gained public trust, whether it is that a devotional panel can aide a believer with prayer, or that a large altarpiece stands for a sympbol of a wealthy group that wants to display its status. Masijs also painted a number of smaller works such as, at the end of the 15th Century, a Saint Christopher (Royal Museum of Fine Arts, Antwerp) that protects men from a sudden death. Salvator Mundi and The Virgin (Royal Museum of Fine Arts, Antwerp) form a diptych and are meant to be viewed close up in order to directly reach Christ, with the intercessor of Mary. After the death of his first wife, he marries Catharina Heyns in 1508. He has ten children with her. In 1507 the Brotherhood of St. Anne in Leuven orders an altarpiece, the Triptych of St. Anne (Royal Museums of Fine Arts, Brussels), for the St. Peter's Church in Leuven. It is the first large project for the painter and is also one of the first complete painted altarpieces that is made in Antwerp. On the middle piece, the family of St. Anea is portrayed and on the side panels are senes from her life. On the backside of the left panel, top right, is: "QVINTE METSYS/ SCREEF DIT 1509". In 1508, still before the Triptych of St. Anne is completed, the Antwerp carpenters order an altarpiece. The carpenters, initially united with the coopers, formed a separate guild in 1497. They wanted, just as with their former guild, a lamentation. 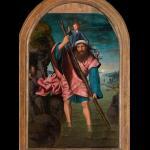 But, on the side panels they elected for their patron saint: John the Evangelist and John the Baptist. The carpenters originally chose for a sculpted tableau (they make the boxes in which the images were destined), but ultimately Massijs received the job. From this, it is maybe that the overfull panels barely fit the sculptured altars. Massijs was clearly inspired by Dürer and Leonardo da Vinci, certainly when he depicts the sufferings of the patron saints. In the middle panel, the Italian atmosphere is clear. Not the sufferings, but the lament after the suffering are shown. This scene is more conducive of reflection and prayer. The group of figures, which is reminescent of Rogier van der Weyden's The Deposition (Museo del Prado, Madrid), are supported by the landscape. The religious drama is considered in detail and harmoniously staged. At the same time, Massijs approaches the great importance of the believers for the narration and the description. Quinten Massijs reconciles a masterly manner, both old and new in The Altarpiece of the Carpenter's Guild (Royal Museum of Fine Arts, Antwerp). In his secular work, Massijs introduces a number of new themes, also here without breaking with the tradition. In Paris, the Gold Weigher and his Wife (Musée du Louvre, Paris) is kept that which are reminescent of The St. Eligius of Petrus Christus (Metropolitan Museum, New York), probably inspired by a lost prototype by Jan van Eyck. The motifs of the still life also invoke the Arnolfini Portrait of Jan van Eyck (The National Gallery, London). These moralising presentations with bankers and city collectors pass into the sphere of humanism and were largely popular. His son Jan would later concentrate on such paintings full of warnings against inappropriate behaviour. Marinus Van Reymerswale will use these motifs as well. His trust in humansim is also expressed in the portraits of Erasmus (The Royal Collection, London) and Peter Gillis (Longford Castle, Wiltshire) that were orders by them as a fit for their friend, Thomas More. Desiderius Erasmus (1466-1536) is naturally sufficiently known and Peter Gillis (1486-1533) is an important figure in humanistic circles. He provides for a number of translations and publications such as, Thomas More's Utopia. Gillis' house in Antwerp is an important meeting place for humanist, diplomats and artists with international allure. Quinten Massijs is also a gladly seen guest. 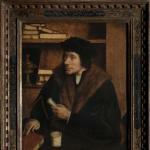 Peter Gillis, as seventeen year-old reader by Dirk Martens, meets Erasmus in 1504. Erasmus give him the advice to study further and they keep contact. Both learned educated men, although they are portrayed on separate panels, are presented in one contiuous study area. Erasmus is busy writing and Peter Gillis points to a book by Erasmus, the Antibarbari, while he holds a letter from More in his left hand. The presentation in a study room makes one think of presentations of St. Hieronymus, who with his bible translation is an example for all humanists. Thomas More let his pleasure about these portraits be known in many letters: "(...) with such a great vituosity that all painters from Antiquity pale in comparison (...)". 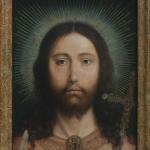 The portrait in the Royal Museum of Fine Arts in Antwerp is a replica made by Massijs. Given that more versions of both portraits exist, he probably made this for Pieter Gillis, Erasmus or yet other friends. Albrecht Dürer visits Massijs at his home on the Huidevettersstraat. The painter and his wife purchase various houses and in 1521 the family moves to a large house on the Schuttershofstraat. The interior is painted by Massijs himself with Italianate decorations (festoons of leaves, flowers or fruit) and grotesques (decorative and symmetric network of lines and figures). In later work, Massijs is still more influenced by Italian exmaples. Not in the least by the cartons of Raphael that were woven in Brussels. The artist stays in the Carthusian cloister in the Antwerp St. Rochusstraat when he dies of consequences from the so-called English Sweating Sickness. During this epidemic more than four hundred men died in a timespan of three days. He was buried in the cloister. The second oldest son from the marriage with Catharina follows their father. Cornelis and Jan are registered as masters. The corporeal remains of Quinten Massijs are transferred, by the request of Cornelis van der Geest, to the Cathedral in Antwerp.